Quasimodo is ringer of the bells. Although he is now in his twenties, he is deaf due to the clamor of the bells in his ears, day in and day out. Nonetheless, he takes pride in his work, for it is an art to make those bells sing in just such a way as he. And for a man with deformities, he doesn't let it limit him, for he has such an agile body, easily swinging and leaping to and fro. He is fond of his 15 bells, “but big Marie was his favorite”. 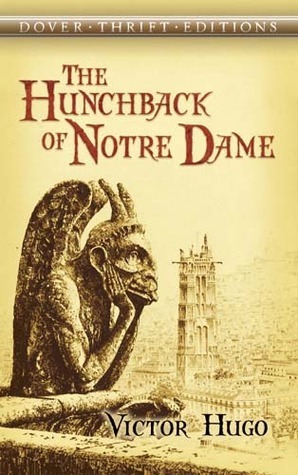 After I got about halfway through the book, sometimes frustrated because I wasn't seeing too many scenes about Quasimodo (I mean, he's the titular character, the reason why I'm reading the book, obviously)... I came to the realization that the story just isn't about him. Perhaps we could say the book is about him, but the story itself? It's actually about Esmeralda, the gypsy girl. The common threads running through every chapter... it's all about how it connects with her. And yes, Quasimodo plays a big part in her story. NOTE to the discerning reader & to parents: I'll give you a little caution; there are some “mature” topics alluded to, so for your vivacious younger readers, they may not be ready for it. Plus there's attempted murder, suicidal thoughts, and public hangings. A novel for high-schoolers and adults. This is a story of loss, recovery, hope, treachery, humbleness, redemption, heroism, and not the least of these, love. That ending? I love it. It has to be one of my favorite classic literature endings, ever. Available on Amazon in paperback, ebook and audio format. This is book #10 for me in the Back to the Classics 2017 challenge. Amy, I'm definitely excited to be finishing up my classics for the year. It's a relief! I've actually finished reading all of them on my list. The review of classic #11 is appearing on the blog tomorrow morning (yay! ), but I've yet to write the review on #12... will get it soon! Right! It's jumbled in my December blogging schedule somewhere. I've never read this classic, and you are inspiring sincere regret over that! Thanks for this great review! I've thought about this for the classics challenge but just had never gotten to it. Hugo's Les Miserables is one of my favorite novels, but it's so long and goes into so many rabbit trails, it's intimidating, and I was afraid this book might be the same way. But I think I will look into for next year. You have me curious about the ending! Anyways, if you do get to read this one next year, I hope you'll enjoy it! I just finished reviewing it, and I had to come back and remind myself of what you said about it. I like the way you summed it up. I wasn't fond of it at first, but then different aspects of it come back to mind that were beautiful. It's certainly not an easy story to digest, as there's so much to think over. So many themes, so many emotions and topics covered... it's incredible how much humanity is in the story. Thanks for coming back to comment after reading it!